Lumbar vulnerability and Paleoanthropology. - Sitting Safely? Development by natural selection has resulted in the mammalian spine, in it’s various forms, becoming a beautifully efficient structure. This has been effected by compromise for often incompatible functions. Lumbar vulnerability origins may arise from even minor variations. The spine has to provide midline central support for the whole body. Give firm anchorage for the weight bearing limb girdles. At the same time it has to allow mobility and respond cybernetically to limb movement and position changes. It has to protect the spinal cord and allow the spinal nerve roots egress. It may also act as a shock absorber to protect the brain. The upright (orthograde) stance adds additional, sometimes conflicting, requirements. These included partial solution to the lumbar vulnerability at the lumbar-sacral junction of the mobile lumbar vertebrae and the mass of the pelvis and a configuration to limit breakdown. It has resulted in a number of midline spinal curves, backward kyphosis and forward, lordosis. Greater height, to see further. Improvement in thermo-regulation required for the savannah environment. Efficient locomotion to escape predators, hunt prey and outrace scavenging rivals. The freeing of the arms from their locomotor function resulted in an increase in manual dexterity allowing new skills and increasing intelligence. Rapid effective response and social organisation were further developed by, and were necessary for, hunting skills. These, in turn, have determined important human social attitudes and behaviour. The development of Agriculture occurred in the Middle East only about 10,000 years ago, probably as a result of climatic changes (Rowley-Conway, 2007) and allowed a more settled lifestyle and may have involved more non-erect, sedentary activities, such as food preparation and repetitive use of groundstone tools for grinding grain. This was mainly a female’s activity while the men were away happily hunting. Archeological evidence shows an increase of spinal degeneration at this time which affected females more than males (Molleson 1994). Bipedalism began about 7-5 million years ago (MYA) with the advent of the Hominidae family, which included ancient forms of modern orangutans, gorillas and chimpanzees and their extinct relatives, such as Ardipithecus and Australopithecus and far down the line, towards modernity, to include humans. Early hominids were originally arboreal, tree living, creatures that began to walk upright along branches and occasionally on land. The basic adaption of bipedalism was well advanced in Africa about 3-4 million years ago (MYA). Climate change had replaced the jungle habitat to arid grassland and small shrub Savannah and the Australopethecines were advantaged by exchanging an arboreal for a mainly terrestrial lifestyle and development of an upright stance and bipedal gait similar to that of humans. The morphological changes are well illustrated by the Australopithecine group, typified by A afarensis and one individual, “Lucy” (or officially Al 288-1), who lived in North East Africa. Bipedalism requires anatomical changes so that the torso can remain balanced upright for most activities and there is an ability to stride forward with the swinging gait which is characteristically human. This requires the lumbar and cervical spine to be extended in a lordotic configuration so that the axial load of the body is directed down to the ground in a near straight line when standing. The head, specifically the foramen magnum, is balanced vertically over the plane of the hip joints, in males, and the point of contact of the foot with the ground. This has been achieved by pelvic rotation (retroversion) to enable the hips and knees to straighten. Anthrapoid apes have a straight spine and the torso weight lies anterior to the centre of gravity, Loading can be brought further back by flexion of the hips and knees, described as ‘Bent Hips/Bent Knees’ (BHBK, gait) is required for an upright stance. This incurs higher energy requirements and a slower gait. Simulation of BHBK walking by humans increases energy consumption by 50%. This is because 80% of energy is conserved by the exchange of potential for kinetic energy by the rising and falling of the centre of gravity. The orthograde upright spinal configuration was achieved, through natural selection, by the lordotic and kyphotic curves (below). Lumbar vulnerability occurs when the wedge angle of the IV disc is reduced..
Lumbar vulnerability origins are dependant on reduction of these angles. The angles that determine lordosis have subsequently been extensively studied. 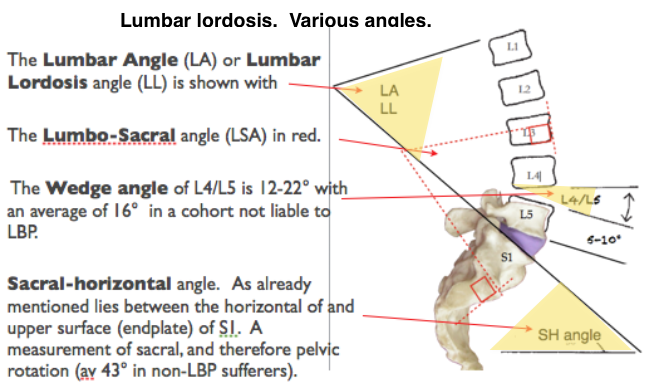 Note, in the diagram above, that the upper surface of S1 forms part of both the Sacral horizontal angle and the wedge angle of L5/S1. 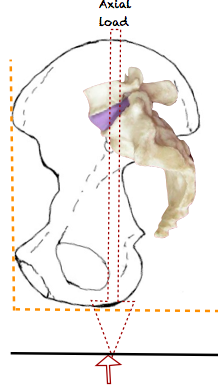 The tilt of the pelvis therefore modifies L5/S1 angle. Upright sitting effects the configuration and reduces the wedge angles. Already mentioned, the origins of lumbar vulnerability show that lordosis developed at two levels of the human spine, cervical and lumbar. 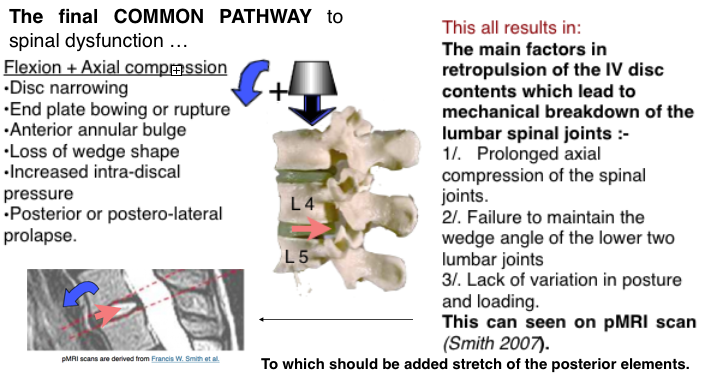 Both these spinal levels are where mobile segments meet a solid mass, the skull and the pelvis, and where mechanical spinal pathology mostly occurs and differences are found when comparing LBP patients with healthy patients (Jackson, 1994). Cyriax wrote in 1946 that “the spinal joints subject to internal derangement are the 4th, 6th & 7th cervical and the 4th & 5th lumbar”. Cyriax also recognised that the lordotic wedging of the Inter Vertebral Discs (IVD) have an important function in protecting the discs (Harrison DD 1998) and is compromised by some sitting positions. An increase of the IV Disk wedge angle. This confers a degree of protection from NP retropulsion. Rotation of the pelvic iliac blades for muscles to change from being extensors to abductors ensure pelvic stability. Relative reduction of the size of the birth canal. The early hominids, such as Homo erectus, had a brain of 900 cc. and its primitive variant, of 1.8 MYA, found at the Dmanisi (Georgia) site was only 650-780cc. These were probably the earliest hominids outside of Africa (Lordkipanidze, 2005). H. sapiens, with a volume of about 1300 cc appeared about 130,000 years ago according to the previous ‘out of Africa’ theory’ (Stringer 1970). Hominids are the only known creatures which are truly bipedal and able to adopt our swinging gait apart possibly wingless birds, such as the ostrich, which are evolved from bipedal dinosaurs. The upright posture occurs in other animals but is usually for short periods and an examination of the skeleton, for example in the penguin, shows a different arrangement with only an analogous appearance of bipedalism. Performing Japanese monkeys (Macaca fuscata). can be trained to adopt an upright posture resulting in lumbar lordosis and bipedalism. Over time some bone remodelling occurs. However energy expenditure is higher than when plantigrade and they revert to this posture when retired from performing (Nakatsukas 2004). Slijper, in 1942, gave a detailed account of the changes in the skeleton of a phocomelic goat that had been born without forelegs. The spine and pelvis had been remodeled with changes suggestive of those found in bipedal animals. Rats have been shown (Cassidy 1968) to adopt a bipedal stance and gait if their forelegs are amputated at birth. Their ability to function is remarkable. Their posture and locomotion are surprisingly similar to that of humans and provides the nearest animal model to the human bio-mechanical condition at the lumbar spine. The lumbar spine adapts by becoming lordotic and approximates to that of the human spine and there are changes in the muscles acting around the pelvis. It can be shown that there is increased axial loading on the lumbar spine and a high proportion of these rats develop back disorders which are usually, almost uniquely, only found in humans. These include degenerative changes, disc protrusion, facet joint degeneration and spinal stenosis. This entry was posted in Uncategorized on July 5, 2013 by Dr. Henry Sanford. I have looked at your ‘Sitting Safely?’ website. Most impressive. I have dropped in for you this week’s copy of ‘Nature’. It happens, by chance, to be relevant as it deals with spinal problems. Interesting articles on latest developments including therapy for the repair of spinal cord injury and (by Mesoblast Ltd) for the intervertebral disc which was the main player in LBP on my introduction to the subject in near prehistoric times. Incidentley your post in http://scienceandartblog.com/author/michaelboulter88/ titled ‘Is it Banksy? Is it Homo?’ is a useful addendum to this (my) post. Lordkipanidze D, Vekua A, Ferring R, Rightmire GP, Agusti J, Kiladze G, Mouskhelishvili A, Nioradze M, Ponce de Leo ́n M, Tappen M, Zollikofer C. 2005. The earliest toothless hominin skull. Nature 434:717–718. Slijper EJ. Biologic-anatomical Investigations on the Bipedal Gait and Upright Posture in Mammals, with special Reference to a Little Goat, born without Forelegs. 1942; Institute of Veterinary Anatomy of the State University, Utrecht, Holland (meeting). Cassidy DC, Yong-Hing K, Kirkaldy-Willis WH, Wilkinson AA. Effects of Bipedalism and upright posture on the Lumbosacral spine and paravertebral muscles of the Wistar Rat. Spine 1968;13:301-308. Krantz, G. S. The process of human evolution. 1981. Schenkman Publishing Co. Cambridge, Massachusetts.